Protecting your employees is a top concern of every manager. This means more than safety glasses, protective gloves, and gear appropriate for the temperature. When you have vehicle traffic of any kind – delivery trucks, fork lifts, construction equipment – it is important that your employees can be seen by the workers operating moving equipment. High Visibility (HiVis) apparel addresses this need; however, often managers and employees aren’t clear on exactly who needs HiVis clothing and what kind needs to be worn. Standards for HiVis apparel are set by the American National Standards Institute (ANSI) and enforced by OSHA. There are 3 ANSI classes for HiVis standards, covering differing work environments and job duties1. Manufacturers have to meet specific guidelines when producing HiVis apparel to be considered ANSI compliant2. Because of varying job duties and work zones, different employees will require apparel compliant with different classes. Though most warehouse workers fall into Class 1, it is important to remember that traffic refers to equipment traffic as well. For example, you should always do a hazard assessment – often Class 2 is sufficient even in high activity areas3. If you have a large fleet of fork lifts and other work equipment moving quickly through your warehouse, where employees are focused on their tasks and not the traffic, those employees are better suited to Class 2 than Class 1. Equipment operators aren’t always operating their equipment – consideration needs to be taken for when they are on foot in a work zone. If the lighting conditions on your dock or in your warehouse are closer to night conditions than daylight, Class 3 compliant garments might be best for those employees. Delivery drivers are subjected to a number of conditions, so you should consider outfitting them in Class 2 or Class 3. It is often easiest to outfit all employees in the highest class required. For example, if you have areas requiring Class 1 and others requiring Class 2 compliance, providing Class 2 compliant gear to all workers means they are visible in all scenarios. There are many types of ANSI complaint HiVis apparel, from vests and jackets to pant sets, overalls and coveralls. When doing a hazard assessment to determine the proper HiVis apparel, it is helpful to consider other necessary protections as well, then determine the best solution of gear for your employees. For example, in conditions that require waterproof gear, a waterproof jacket that is ANSI compliant is a better choice than a waterproof jacket paired with an ANSI compliant vest. Workers who only enter the warehouse occasionally, on the other hand, can utilize an ANSI compliant vest over their other gear. You might also consider accessories, like gloves and headwear, or footwear that features visibility-enhancing features. Many of these items will have reflective piping or accents that may make a user more visible head-to-foot. In environments that require HiVis apparel but also have added safety concerns such as low temperatures, what is the best way to address all safety needs? One solution is to have employees wear the proper ANSI compliant vest over their insulated clothing. But vests can be lost and may need to be replaced often, and if you require ANSI Class 2 or 3 compliance, those vests can start affecting movement and productivity when placed over heavier insulated gear. Requiring gear that both protects from temperature and is ANSI compliant reduces the risk of lost or misplaced HiVis vests, increases the longevity of gear, and helps with productivity as employees are not wearing unnecessary layers. It is also important to note that Class E compliant items, such as pants, bibs and overalls, make an outfit Class 3 compliant when paired with a Class 2 jacket or vest. 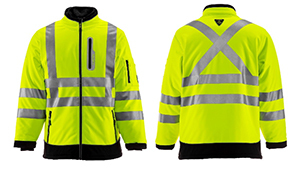 Selecting apparel with the reflective tape in an alternate shape enhances safety in low-visibility environments. Reflective tape can be used to signal to a driver if a worker they are driving towards is facing them or not. By utilizing a different pattern of tape on the front (an H shape) than on the back (an X shape), other workers will know if the person they are nearing might see the approaching vehicle. Canada’s standards for safety, CSA Z96, require the X shape in tape on the back for compliance. If you need to meet both ANSI and CSA standards, you need garments with the added X-Back feature. When choosing HiVis apparel, it is important to consider the background your workers will be seen against. Is the majority of the equipment you use yellow? You should choose orange protective gear to assist with contrast. Workers deal frequently with orange shipping containers? The gear they wear should be yellow to prevent blending. Compare different HiVis materials to the background your workers are in to find the best contrast for your environment. Not all work environments require HiVis apparel, but when it is required it is important to consider all the factors of the environment and job duties before selecting gear for your employees. Check federal and state OSHA guidelines for your work conditions, and make sure your vendor’s HiVis gear is not just labeled “High Visibility” but is ANSI compliant for your specific needs.